Chicago's mayor and police superintendent appear to be blindsided by the prosecutor's decision. A grand jury had indicted the “Empire” actor earlier this month on 16 felony counts for allegedly lying to Chicago police about a hate-crime attack. The result sent shock waves throughout Chicago, where Police Superintendent Eddie Johnson and Democratic Mayor Rahm Emanuel issued a condemnation of the prosecutor’s decision, appearing blindsided by the news. “We found out about when you all did,” Johnson told reporters. Magats said Tuesday’s outcome is the result of an alternative to prosecution allowable under Illinois statute. About 5,700 out of 60,000 cases have been referred to “some kind of deferred prosecution, or alternative prosecution,” Magats said. The office took into account Smollett’s lack of a violent criminal background and the “facts and circumstances of the case.” Smollett had been charged with Class 4 felonies, the lowest classification. 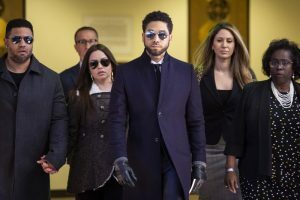 Meanwhile, Smollett’s attorney, Patricia Brown Holmes, offered a different characterization, telling reporters inside the courthouse Tuesday that the actor “voluntarily” forfeited his bond and that there was no deal made with prosecutors. “There is no deferred prosecution,” she said. Johnson, the police superintendent, said Smollett and his attorneys “chose to hide behind secrecy and broker a deal to circumvent the judicial system.” Emanuel said the $10,000 Smollett paid to be released on $100,000 bond “doesn’t even come close” to the resources the city and police department used over the course of the investigation. Smollett’s case, which began in January when the actor said he had been attacked by two men who yelled racial and homophobic slurs, captivated the nation’s attention as the investigation took several bizarre turns. Smollett was first charged in February with disorderly conduct for allegedly filing a false police report. The actor, who is black and gay, told police in January that he had been attacked around 2 a.m. in Chicago’s Streeterville neighborhood by two people who yelled racist and homophobic slurs, wrapped a rope around his neck and poured an unidentified chemical substance on him. The actor said at least one of his attackers had invoked President Trump’s “Make America Great Again” campaign slogan, yelling “This is MAGA country!” during the attack. The charges against Smollett heightened tensions in Chicago, where Johnson issued a public rebuke of the actor, saying Smollett “took advantage of the pain and anger of racism to promote his career.” Residents also voiced frustrations with the police department, criticizing how it had poured resources into investigating Smollett’s claims in a city of high homicide rates. Some remained skeptical of the findings presented by the department, which already had a fragile relationship with the black community in the city. As recent as 2017, federal investigators concluded that police had routinely violated the constitutional rights of Chicago’s residents, particularly those of color.